February has come and gone, I don’t even know if I noticed it was here. I know it is a short month, but it flew by. I wanted to share some highlights from the month with you guys. I am getting new readers daily, which is so exciting! This way any newbies can catch up on the happenings around here at Our house now a home. I started the month out with a farmhouse table that I made. This specific project with full tutorial can be found at Homedit. I just had to share it with you all! 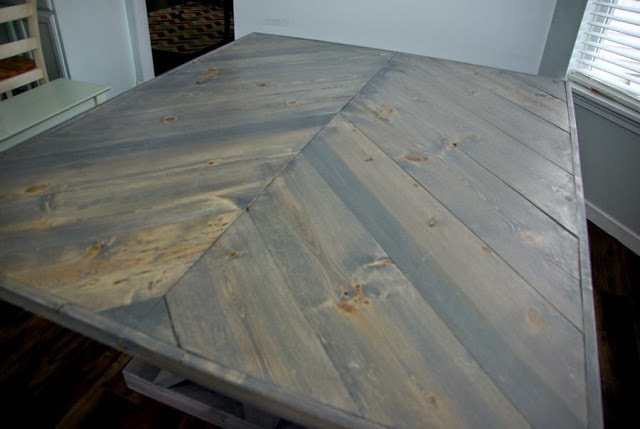 This table has my heart in all of its rustic glory, I get giddy looking at this. 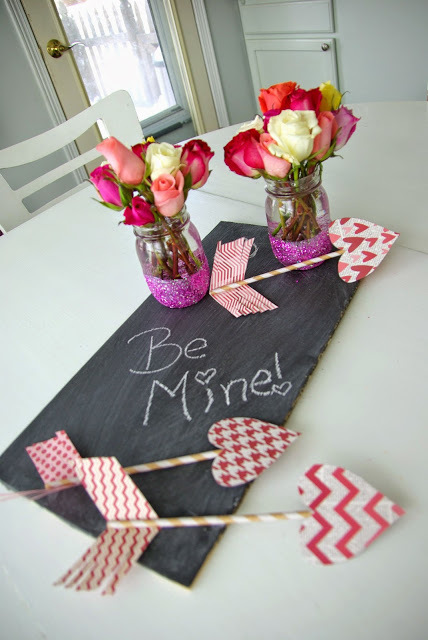 I shared some different ways to dress up a table for Valentine’s day. I also made these glitter mason jars and paper love arrows. It was a month of love. I was still wrapping up Nora’s birthday decorations from the previous month. It was a Frozen wonderland. There was lots of crafts and fun ideas Nora and I came up with. The decor involved diapers, yep, diapers. Click over and see what I did. HUGE focal point in this room. This wall they are on is far from done, they will be well accompanied with many other storage ideas. Who needs moss balls? Pfft, standard crafting stuff. I created moss squares, I am creating groundbreaking content! Alert the press’s, call CNN, this is big news here. 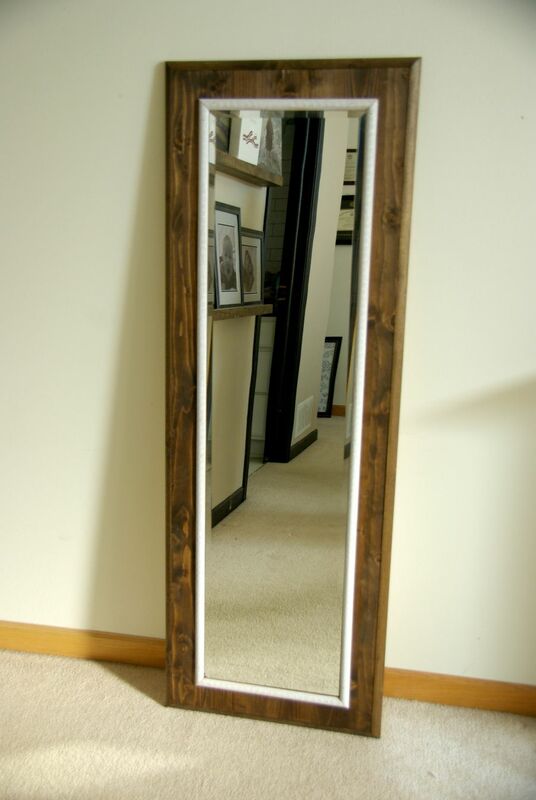 This DIY mirror frame was something I had been wanting to do for a while. I finally got the opportunity to do it. These things cost a lot of money in stores, I managed to create the frame for the same cost it takes for my family of 5 to go out to eat at a restaurant! I helped you all get a little more acquainted with the 6th member to this family, Teddy. He is the needed piece that makes this house a home. 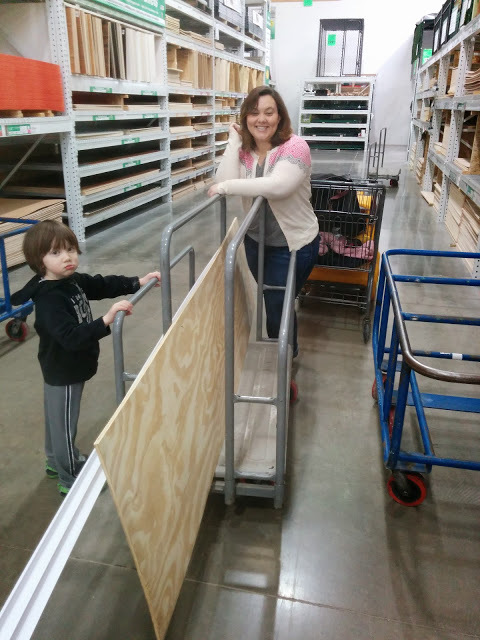 I also introduced a new series happening at this here blog, weekend DIY warrior recap. I share the going’s on in our home from the weekend. Showing little sneak peeks, hints, and maybe some tiny reveals of what we are working on. Also some fun behind the scenes stuff that has never seen the light of internet day. Until now. Apparently organizing was on my brain in February, it is my type A, Virgo side coming out. Lists and organizing kind of get me going. 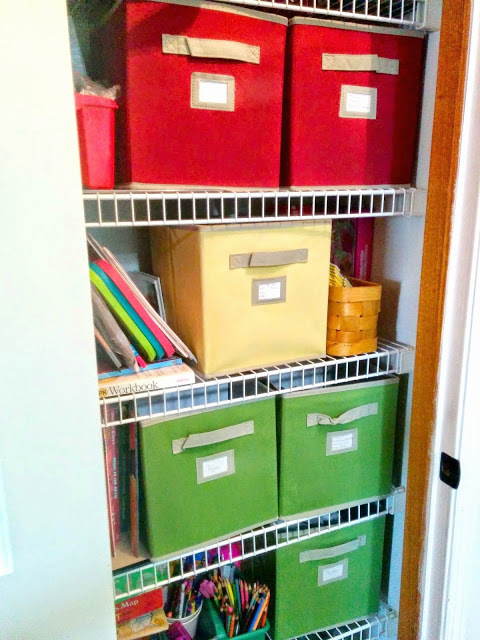 I shared two ways that I organized this art supply closet. The second sharing was my color coordinated bins for my kids. It has worked wonders in having them keeping things together. Steal this idea, use, it, abuse it, it works for little ones. big or small , I don’t discriminate. 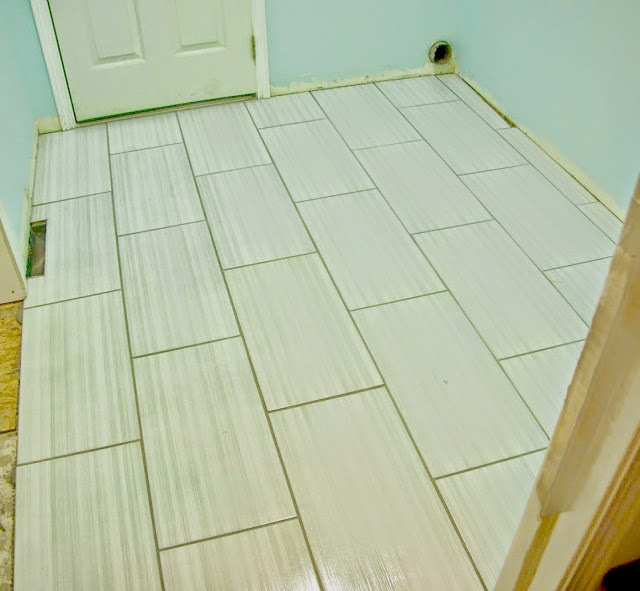 This tile, these ladies are beauties! I never looked back, it is full steam ahead now with this redo. I ended the month with high hopes that Spring was on it’s way. Cut two three days into March and we get 5 inches of snow. Yeah, Mother Nature laughed at my plans and showed me who is boss. But, in my home I am boss and I got rid of all of my winter trappings. 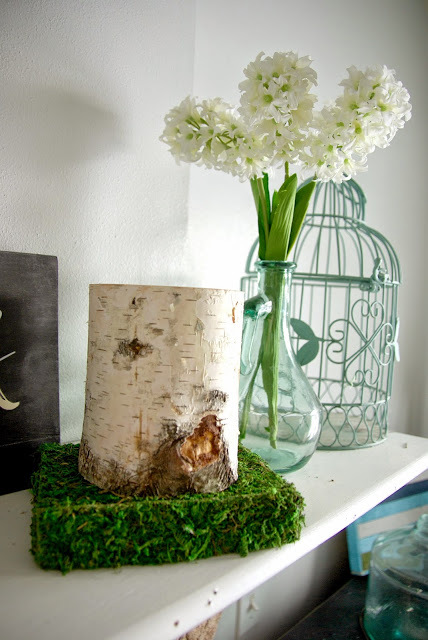 I whipped out my Spring decor and love the bright, fun, and cheery feel it gives the house. 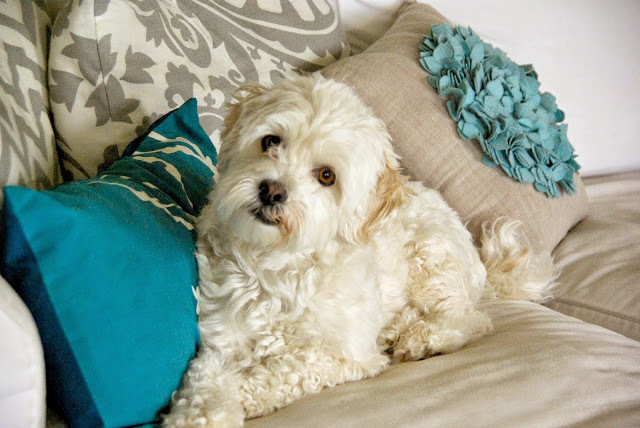 I gave a mini house tour and let you all peruse my spring additions. Whew, I was worried I would not have much to show in this review. I never realize how much I do in a month. Seeing all of this makes me exhausted. I am lucky to have a wonderful man, Dale who is right there with me DIYing away to our hearts content. This following month will see a lot more Spring crafts, and more laundry and mud room projects. Lots of fun, custom, and creative ways of maximizing space in there. 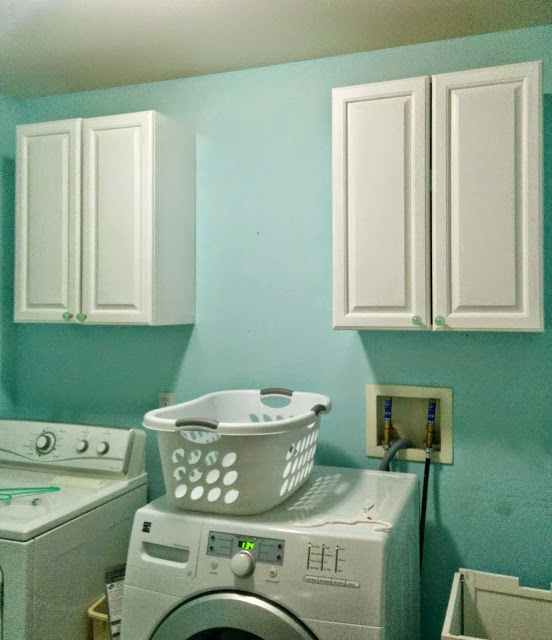 Think Tiny House, but in a laundry room. February was a big month of plans, beginning to execute them, and getting ready to welcome in Spring. 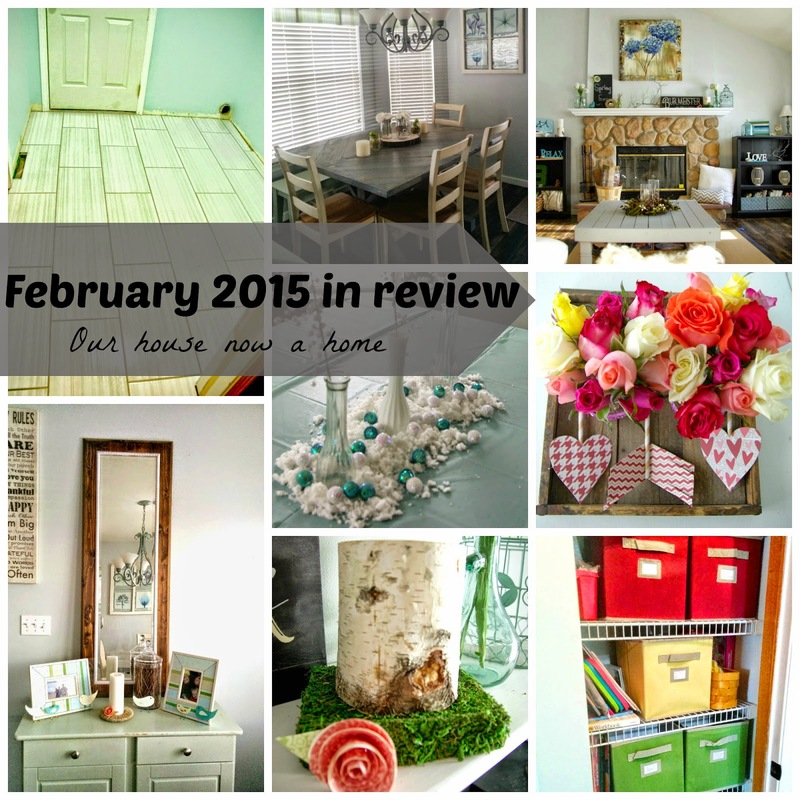 Did you do anything home decor, DIY, or craft related in February? If you did spill it here, tell me all about it. 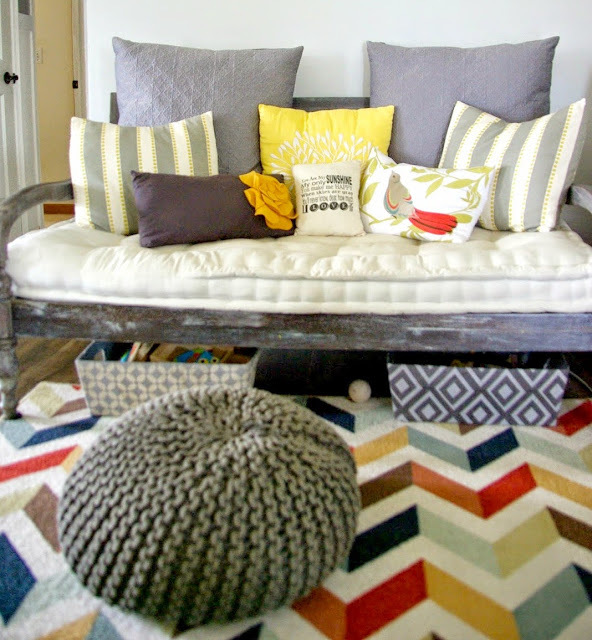 It is pretty much required to gush about home decor at a blog like this. I am not the only one getting crafty. Who is ready for Spring? 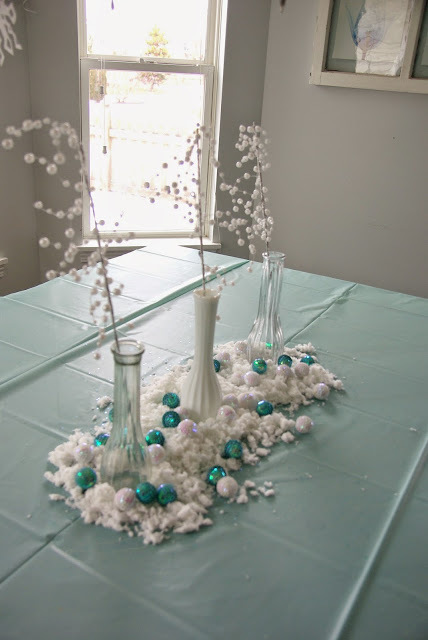 Great recap…I broke out my Spring decor too…so sick of snow at least indoors it can feel like Spring! I am the same way, if we could rush this end of winter I would be so happy! Bring on warm days, and some actual color other then snowy white outside! Painting is pretty simple. And if you mess up, paint over it and start again! Thank you, I wanted to do a different table top for my farmhouse table then a standard one. It was a little more work, but so worth it! Love it all! Especially the table and the closet. I love everything. I need to get on the ball with decorating! I'm tired of looking at all of my dark winter decor. Thank you, it was fun making it more colorful and bright! Way to kill it with the projects!! You were a busy, productive lady in February! Did you sleep at all? 🙂 Happy March! I love the wooden table and I agree, I'm ready for winter to be over and welcome spring! Lovely home! Thank you, the farmhouse table was a big project. But, I am so happy we did it. We might be getting 50 degree temperatures next week. I am giddy! Thank you so much Kim! That is really nice of you to say. Good luck in your decor endeavors and getting off of your hiney! Talk about being productive, even in a short month! Way to go!